As its name implies, the OVAL Shape Face is longer than wide, with a jaw that's narrower than the cheekbones. Because the oval shaped face has no dominant areas and is so proportional, this face looks good with just about any hairstyle, length or texture. 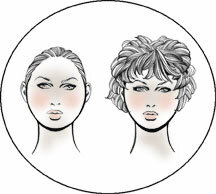 The ROUND Shape Face is characterized by a wide hairline and fullness below the cheekbones. The client may be overweight and the neck may appear short. These faces look very good with a geometric or linear style. Add height, when possible, and long, wispy side areas to make the cheeks look narrow. Comb hair close to the head on the side and at the nape. The SQUARE Shape Face is characterized by a wide hairline and jaw. Square shaped faces need height on top and narrowness at the sides. Comb the hair off the forehead to add height to the face. 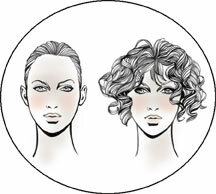 Curly texture and wisps of hair around the face break the wide, straight lines common to the square face. The HEART Shape Face is characterized by a wide forehead and a narrower chin. Bring some hair onto the forehead to disguise its width. Keep hair close to the head at the eyes but make it slightly full around the jaw, and below and in front of the earlobes.